My grandson, Tanner, turned three on the 10th and this is the card I made him. His party theme was Minions so I thought I would stay with the theme. 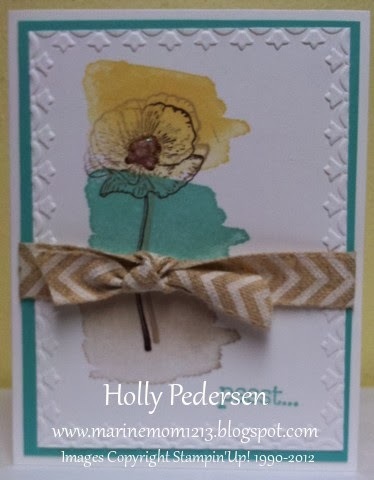 The cardstock colors that I used are Pacific Point, Whisper White, Daffodil Delight, Basic Black, Soft Suede. The greeting is from Sassy Salutations. 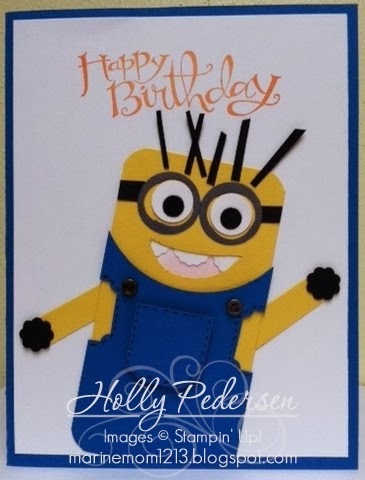 I started with the Minion's body in daffodil delight and just cut a rectangle. I rounded the corners and then cut another rectangle in pacific point. 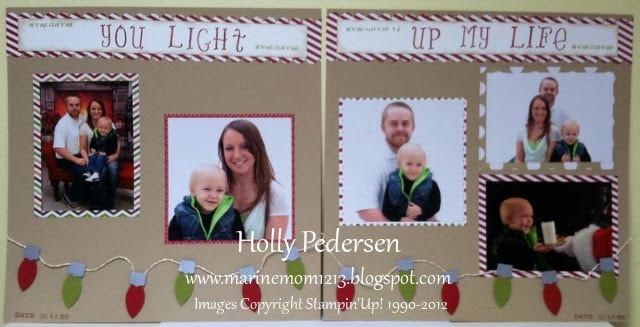 I used a circle punch to curve around his neck and then I used the ticket builder punch to cut the arm holes. From the daffodil delight, I cut out his mouth so that I could add teeth and tongue to the back side. I made his eyes and glasses with the circle punches and a hand held punch for the blacks of the eyes. Some scrap black cardstock added as hair finishes off this cute little guy. 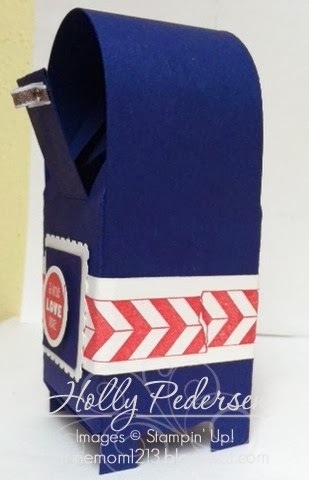 Hello, my share today is a cute little mailbox made with the mini milk carton die. I don't remember where I saw this but my husband is a mailman so I just had to make one of these for him. All you do is cut out your milk carton and assemble like normal except you do not glue the entire top closed. You will want to cut a little flap that can be opened and closed and with it open, glue the rest of the top closed. For my handle I just used some of the silver ribbon and attached it to the flap with mini brads. To make the milk carton look like a mailbox, I just put a strip of Night of Navy around the sides. To make the legs I used the mini curly label punch. 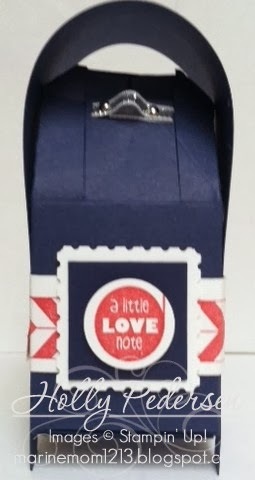 I used the stamp sets Tape It and Love you to the Moon. I gave this card to my husband on Valentine's Day. 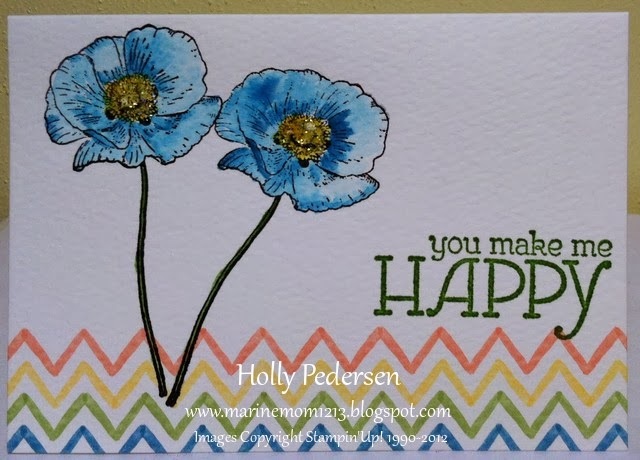 I wasn't sure I would use the new Hardwood stamp that much, but I really love what it adds to cards. My base is crumb cake with the second layer being cherry cobbler. The hardwood was stamped on crumb cake with early espresso ink. I used the Hearts framelits to cut out the heart. I stamped a smaller piece of crumb cake with the hardwood as well so that I could pop up the top layer and still have my "wood" underneath. A little sponging around the heart on both layers just makes it really pop. 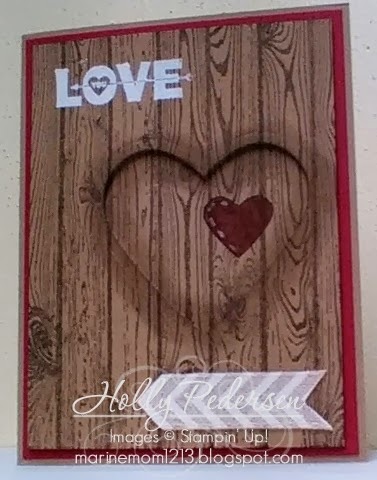 I used a template cut with the smallest heart from the hearts framelits to color the little heart with cherry cobbler. I then added a few lines with the white gel pen. My greeting came from Love you to the Moon found in the Celebrate the Everyday catalog and is stamped in versamark and embossed with white powder. 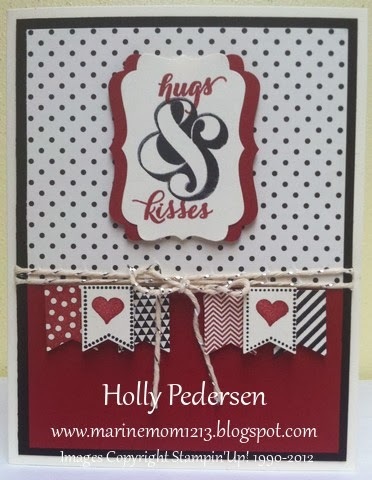 A little of the Natural Chevron Ribbon finishes this card off. Here is another Valentine's card that I came up with. I love playing with new supplies. For my greeting on the card I stamped directly onto the Pink Pirouette using Primrose Petals. 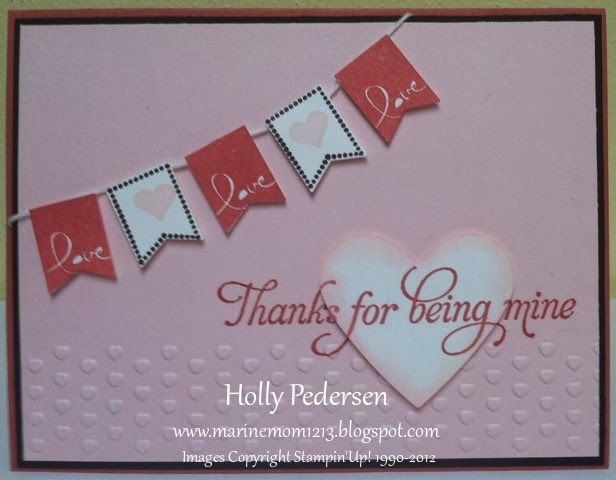 I then stamped the same greeting on whisper white and used the full heart punch to punch out a portion. I lined up the words and used dimensionals to adhere the heart. The little banners are also adhered with dimensionals.